Telluride is a rare jewel of a town nestled in the Colorado mountains. At 2,66m above sea level, the air is thin and takes some getting used to as we discovered every time we stood up too quickly. The residents live a carefree and happy existence spending their winters skiing and their summers pursuing a multitude of outdoor activities. If you live in Telluride, life is good. People leave doors unlocked and everyone seems to know each other. We’ve been lucky enough to be invited to this magical utopia for the last three years to play the Ride Festival – a beautiful gathering, now in its sixth year. Telluride has embraced us and we’re delighted with this happy union. This years trip was brilliant and deserving of its own entry into the tour diary of which I have become sadly negligent of late. We’ve spent more time at home with our families this year. We needed a break. It felt like we’d been touring constantly, have faced a few issues and were feeling a bit burned out. The best thing for us was to step back from touring, give ourselves some breathing space to regroup and focus on making album 3. 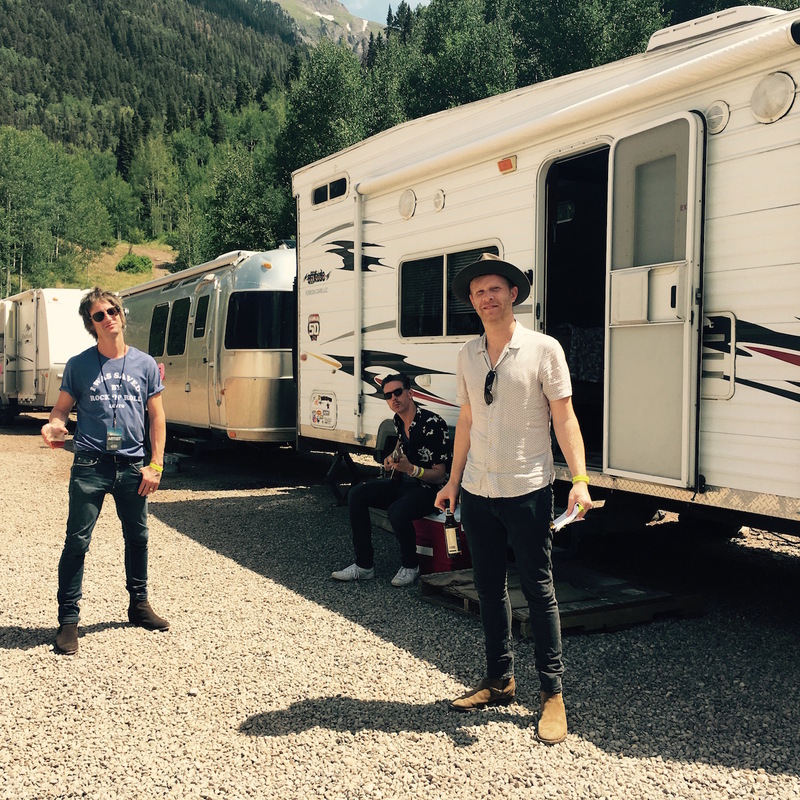 This done, we embarked on our trip to Telluride with renewed vigour and a stable of new tunes to unleash. Getting to Telluride involves 3 separate flights and a further drive up into the mountains. By the time we arrived, we were in a light headed delirium of jet lagged excitement. We’d been told that Beck would be playing a show in the local high school theatre. Despite almost hallucinating with fatigue, we couldn’t miss out on this opportunity so, after a dip in the hotel hot tub and a quick bite, we walked to the high school conveniently located next door to our hotel and danced to “Devils Haircut”, “Loser” and “Sexx Laws” until the room started spinning and we had to go to bed. I was up before the sun the next morning. This was a general theme throughout our stay in Telluride, for me at least. Regardless of what time I went to bed, my eyes would spring open at the crack of dawn and I’d have hours to wait before breakfast started. On the third morning, for example, I woke up, showered, made a cup of tea, updated our website, had breakfast, took a gondola over the mountain to the Mountain Village and was in a yoga class by 8.00am feeling like a superhero. This was even after drinking beer, espresso martinis and several tequilas the night before. It must be the clean mountain air! It’s a rare occurrence that we all engage in an activity together but we managed it in Telluride. We hired inner-tubes and floated along a fast moving stream of icy meltwater from the mountain peaks like human pooh-sticks (to those wondering what the pooh-sticks are, it’s not what it sounds like!) To describe them as Rapids might be a bit of an exaggeration but it got pretty exciting at points. The hard part was getting out before being carried miles out of town and having to walk all the way back. Phil managed to fall out of his tube into the testicle shrinking icy water and endured a cold, shivery walk back to the hotel. It wasn’t all fun and games in the mountains. We also had to get down to the serious (ahem!) business of being The Temperance Movement. Our first of two performances was a late show in the Sheridan Opera House, a 250 capacity venue in the middle of Telluride. There was a buzz in town about this gig presumably due to our previous visit. It had sold out and when we arrived at the venue there was a long line of people forming. After what has been a turbulent period for the band, what we experienced at the Opera House that night was joyous. It reminded us of why we do this. We’ve all made a big commitment to this band and it’s not always been easy. there have been some tricky times to navigate but when we find ourselves in a room full of people loving what we do and who are willing us to succeed, it strengthens our resolve and makes it all worth it. Thank you to everyone in the room that night, it was a special moment. The next day we played the main stage at the festival. The Ride festival stage must have the best backdrop in the world. Snow capped mountains and a 300ft waterfall under cobalt skies. The whole scene looks like it’s been put through an instagram filter. It’s unreal! The gig was great. A different beast than the night before. A small dark room vs a vast expanse of space in daylight makes for a less intense experience but no less enjoyable. It was the perfect day – A rock’n’roll show in an incredible setting, a diet of fish tacos and tequila and a soundtrack provided by Beck who closed the festival. As the sun set behind the mountains and the new moon rose in the sky, we danced and drank with new friends.